Eat. Live. Laugh. and sometimes shop! : Gift closet. Saw this posted by Momfilter on Facebook and just had to pass it along. 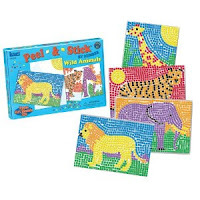 These sticker mosaic kits are fantastic for ages 4-9. I just stocked up on a bunch for gifts. Only $9 for hours of entertainment! Make the picture come alive as you create beautiful mosaic scenes by placing the sticky foam squares on the numbered scene boards. Then attach the magnet strip to displayour finished works of art on the refrigerator, file cabinets, or lockers.